Hokkaido University researchers have developed a strategy to fabricate materials that become stronger in response to mechanical stress—mimicking skeletal muscle growth. Their findings, published in the journal Science, could pave the way for long-lasting materials that can adapt and strengthen based on surrounding conditions. The strategy was inspired by the process that makes human skeletal muscles become stronger. As a result of strength training at the gym, for example, muscle fibres break down, encouraging the formation of new, stronger fibres. For this to happen, the muscles must be supplied with amino acids, the building blocks of proteins, which join together and form muscle fibres. Hokkaido University's Jian Ping Gong specializes in polymer science. Her research team developed a strategy employing 'double-network hydrogels' that emulates the building process of skeletal muscles. Double-network hydrogels are a soft, yet tough material formed of about 85 weight percent water and two types of polymer networks: one rigid and brittle, and the other soft and stretchable. The team placed a double-network hydrogel inside a solution containing molecules, called monomers, which can be joined to form larger compounds called polymers. This solution emulates the role of circulating blood carrying amino acids to skeletal muscles. 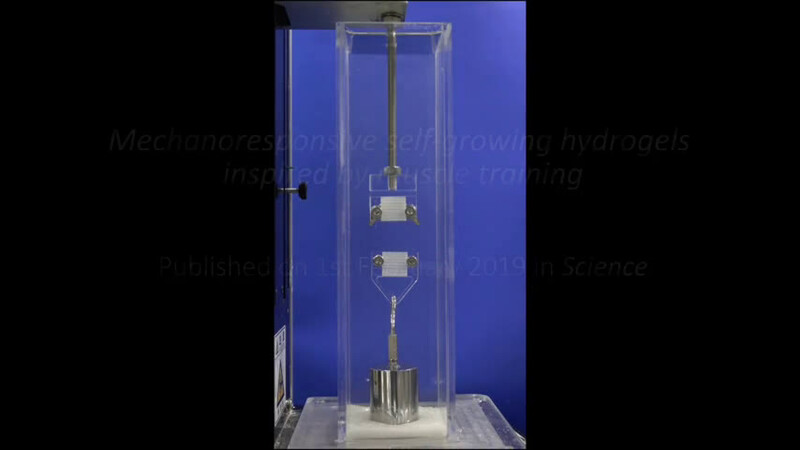 Applying tensile force (stretching) to the hydrogel causes some of its rigid and brittle polymer chains to break. This leads to the generation of a chemical species called 'mechanoradicals' at the ends of the broken polymer chains. These mechanoradicals can trigger the joining up of the monomer absorbed into the hydrogel from the surrounding solution into a polymer network, strengthening the material. With successive stretching, more breaking down and building up occurs, similar to what happens with skeletal muscles undergoing strength training. Through this process, the hydrogel's strength and stiffness improved 1.5 and 23 times respectively, and the weight of the polymers increased by 86%. The team was further able to tailor the material's response to mechanical force by using a specific monomer that altered the gel's reaction to heat; heated at high temperatures, the gel's surface became more water-resistant. The researchers say their work could help with the development of self-growing gel materials for applications as flexible exosuits for patients with skeletal injuries; these suits would potentially become stronger and more functional the more they are used. Professor Gong explained "Since many types of DN gels have similar mechanical features, this process could be applied to a wide range of gels, expanding the range of potential applications."